The Cosmosphere is one of The 8 Wonders of Kansas because it has one of the most significant collections of U.S. and Russian space artifacts in the world! TheCosmosphere, conceived by long-time Hutchinson resident Patricia Carey, is one of America's premier space centers. Making its start as a small planetarium on the Kansas State Fairgrounds, the Cosmosphere is now an internationally-acclaimed staple of the space science community. 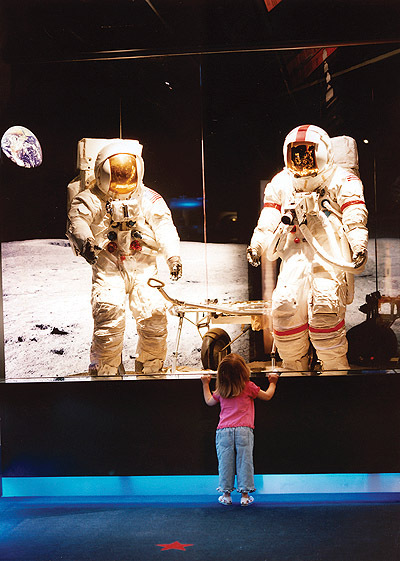 Educating patrons from around the globe, the Cosmosphere boasts the Hall of Space museum, one of the most significant collections of U.S. and Russian space artifacts in the world; the Carey IMAX Dome Theater, one of only 14 IMAXR dome theaters in the world; a planetarium; and astronaut training camps for all ages. Located in central Hutchinson, the Cosmosphere, a non-profit organization, is unique to Kansas. 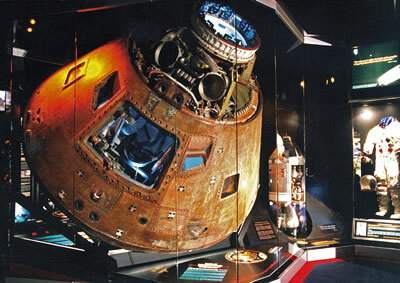 Its Hall of Space Museum is one of only three museums in the world to display flown spacecraft from all three early-manned space programs - Mercury (Liberty Bell 7), Gemini (Gemini 10) and Apollo (Apollo 13). In regard to depth and size, the Cosmosphere's space artifact collection is second only to that of the National Air and Space Museum in Washington, D.C. Similarly, the Cosmosphere's Hall of Space Museum harbors the largest collection of Russian space artifacts outside Moscow. 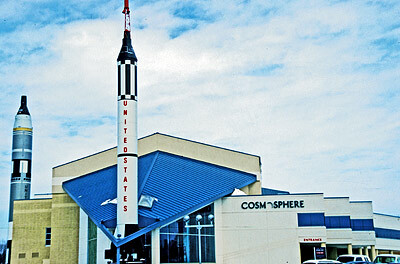 Proudly placed in Kansas, the Cosmosphere has also taken part in many documentaries and films. Most notably, the Cosmosphere built the spacecraft and hardware used in the movie Apollo 13, starring Tom Hanks. Hours and admission charge: Monday-Thursday 9 a.m.-5 p.m.; Friday-Saturday 9 a.m.-7 p.m.; Sunday noon-5 p.m. (check web for schedule changes). Admission for single venue is adults $9.50; children 5-12 $9.